The IQA World Cup is an international quidditch tournament contested by the national teams of the members of the International Quidditch Association, the sport's global governing organisation. The championship, which was named Summer Games and Global Games in its first two editions, has been awarded every two years since 2012. The current champions are the United States, who defeated Belgium in 2018. Sarteano is a comune (municipality) in the Province of Siena in the Italian region Tuscany, located about 100 kilometres (62 mi) southeast of Florence and about 60 kilometres (37 mi) southeast of Siena. ↑ QPD stands for "quaffle point differential" where the final score is tallied ignoring the 30 points given when the snitch is caught. ↑ SWIM stands for "snitch when it matters" coming into play when a team wins when within snitch range, i.e. ± 30 pts. The International Quidditch Association (IQA) is the governing body for the sport of quidditch. It was founded as the Intercollegiate Quidditch Association in 2009 following the very first intercollegiate quidditch match. In 2010, the IQA took its current name, and 2016 saw its induction as an international sports federation with its creation of the Congress. It now comprises more than ten national associations governing quidditch in their respective nations. The European Quidditch Cup, also known as EQC and formerly as the European Quidditch Championship, is the culminating championship tournament for the sport of quidditch in Europe. It began to be legitimised in 2014 when the International Quidditch Association became an international federation for quidditch. The first tournament took place in 2012 in France as quidditch began to develop across Europe. Today, the tournament is the highest level of championship in Europe besides the European Games with league-level tournaments being the qualifying competitions. EQC 2018 was held in Pfaffenhofen an der Ilm, Germany, where the Paris Titans won the championship for the third time in their history. QuidditchUK is the official governing body of quidditch in the United Kingdom and is affiliated with the International Quidditch Association. It began in 2011 as a Facebook group intended to act as a network for quidditch teams and players within the UK to communicate with each other, become aware of local teams and resources, and set up matches and new teams. The US Quidditch Cup, is a quidditch tournament held in the United States and organized by US Quidditch. Held every year since 2007, it features collegiate and community clubs primarily from the United States. The tournament was formerly known as Quidditch World Cup, but that name now refers to the international championship IQA World Cup. The Belgium national quidditch team, also known as the Belgian Gryffins, is the national team of Belgium in quidditch. The team was founded in 2014 upon the announcement of the 2014 IQA Global Games, the International Quidditch Association's second international tournament featuring national teams. Quidditch Canada is the governing body that oversees quidditch within Canada under its mother organization, the International Quidditch Association. The United Kingdom National Quidditch Team, colloquially known as Team UK, is the official national Quidditch team of the United Kingdom. Team UK made its debut in 2012 at the IQA Summer Games in Oxford, UK where it placed 5th of 5 teams. The team then played in Canada at the 2014 IQA Global Games in Burnaby, BC on July 29, 2014 where it placed 4th of 7 teams and in the European Games in Sarteano, Italy in July 2015, placing 2nd of 12. Team UK gained its first medals at the IQA World Cup 2016 in Frankfurt on July 23–24, 2016, finishing 3rd out of 21 teams. In 2017 the team gained its first international trophy, winning the IQA European Games, beating France in the final. Belgian Quidditch Federation, or BQF, is the governing body of quidditch in Belgium. It was founded in 2012 as a Facebook page to garner interest from potential players and teams within Belgium and began to take shape in 2013 with the introduction of its first two teams: Deurne Dodo's and the Brussels Qwaffles. The organisation began to take shape as a non-profit in early 2014 with the formation of the newly-international International Quidditch Association in the form an international federation. Belgian Quidditch Federation maintains one delegate within the IQA Congress as a member of Quidditch Europe alongside Quidditch Nederland (QNL) and the Luxembourgish Quidditch Federation (FLQ). On 10 October 2014, BQF changed its name from Belgium Muggle Quidditch to its current name to better integrate with other sports in the country. Quidditch is a growing team sport in Canada. Due to its relative youth within the sports scene of Canada, adoption is not as widespread as other sports such as rugby or ultimate. However, adoption is picking up with additional university and community teams each year. As a result of its inclusivity and its many niche styles of play, a wider spectrum of individuals are drawn to this sport than other mainstream sports. For the moment, the majority of teams are based in Ontario, Quebec, British Columbia and Alberta, but teams are rapidly starting up in Saskatchewan, Nova Scotia and Manitoba. Quidditch Canada is the governing body for the sport across the country; there are no associations within Quidditch Canada that govern provincially/territorially. The 2015 IQA European Games, also known simply as the European Games, was the inaugural European championship for the sport of quidditch organized jointly by Sarteano2015, Quidditch Europe and the International Quidditch Association. The tournament was held the weekend of the 24–26 July 2015 in the city of Sarteano, Italy. France took first against the United Kingdom with a final score of 90*–50, and Norway came in third winning 150*–80 against Belgium. The Spanish Quidditch Association is the National Governing Body (NGB) of quidditch in Spain, affiliated to the International Quidditch Association. It began in 2013 as a Facebook page and as an internet forum, to coordinate and gather the players and teams that were appearing in Spain until it became an association. The Spanish national quidditch team is a team created with Spanish quidditch players. Since 2015 it has represented Association Quidditch Spain in the different national team tournaments organized by the IQA. 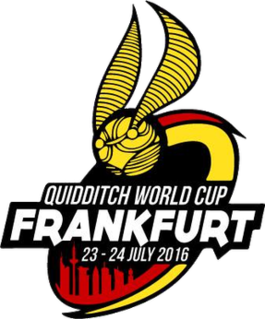 The 2016 IQA World Cup is the third edition of the IQA World Cup, the international quidditch championship organized by the International Quidditch Association. It was held in Frankfurt, Germany on 23–24 July 2016. Australia won the Cup 150*–130 against the United States, who had won all the previous editions. 21 nations competed, including Australia, Canada, Ireland, and the United Kingdom. A crowdfunding campaign aimed to send the Ugandan team as the first ever African nation to compete internationally. However, the team members failed to obtain a German visa and withdrew from the competition. The Peruvian team also withdrew before the competition due to a lack of funds. A documentary entitled Fly The Movie: Journey To Frankfurt followed the British team in their preparation before the Cup. The Australian national quidditch team is the official quidditch team of Australia. The team is regulated by Australian Quidditch Association and is a national member of the International Quidditch Association. Australia made its debut in 2012 at the IQA Summer Games in Oxford, UK. The United States national quidditch team is the official quidditch team of the United States. The team is regulated by US Quidditch and is a national member of the International Quidditch Association. The team has won the most IQA World Cup titles, winning the 2012, 2014, and 2018 titles. The USNT only competes in events once every two years; at the IQA World Cup, as it is geographically ineligible for the only other current international Quidditch event; the IQA European Games. The 2017 IQA European Games were the second European championship for the sport of quidditch. The tournament was held on 7–9 July 2017 in Oslo, Norway and was hosted by the Norges Rumpeldunkforbund and local club OSI Vikings. All European IQA member nations in good standing were allowed to compete. The winners of the tournament were the United Kingdom, who defeated the defending champions France 90*-70 in the final. France subsequently took the silver medal and Norway won the bronze, after defeating Belgium 140*-80. This tournament marked the United Kingdom's first international gold medal at quidditch. 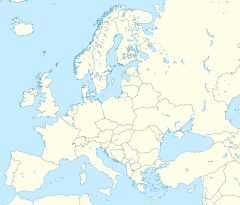 ↑ "European Games Date and Location Announced". International Quidditch Association. 24 February 2015. Archived from the original on 2015-12-08. Retrieved 26 July 2015. ↑ Solinsky, Kolby (25 February 2014). "Grab Your Brooms! Quidditch Global Games coming to Burnaby, B.C. in July". Burnaby Newsletter. Archived from the original on 3 January 2015. Retrieved 2 January 2015. ↑ Scammell, Rosie (26 July 2015). "France beats Britain to win first European Quidditch Games". The Guardian. Retrieved 26 July 2015. ↑ Marmer, Andrew (27 March 2015). "Andrew Kasimir Takes Over as Asia Editor". The Quidditch Post. Retrieved 26 July 2015. ↑ Marmer, Andrew (26 July 2015). "France Captures European Games Over UK". The Quidditch Post. Retrieved 26 July 2015. ↑ "Quidditch Europe Announces the Inaugural European Games". Quidditch Europe. 22 November 2014. Retrieved 26 July 2015. ↑ Philipson, Alice (21 July 2015). "First Quidditch European Games to be held in Tuscany". The Telegraph. Retrieved 26 July 2015. ↑ Sarteano2015. "Sponsors". Archived from the original on 2015-07-27. Retrieved 26 July 2015. ↑ Gigliotti, Mirco (5 July 2015). "Artisans, hobbyist and local shops for Sarteano2015". Sarteano2015. Archived from the original on 2015-07-28. Retrieved 26 July 2015. ↑ Pantalaemon (6 July 2015). "12 équipes nationales de quidditch aux European Games !" (in French). Gazette du Sorcier. Retrieved 26 July 2015. ↑ "EQC III Announcement". Quidditch Europe. Facebook. 1 November 2014. Retrieved 19 November 2014.